I was pretty happy and 'going steady' with my 3 lil eye shadows from Revlon Shadow links. I thought they were really nice, simple, suited everything I wore, what more could I want? But NO, I realized I was just 'settling' for them. I had always wanted a palette, but palettes were expensive & I didn’t seem to like anything so much that I could commit to buying the whole palette. So I was stuck in a "routine relationship" with my Revlon shadow links for about a year. 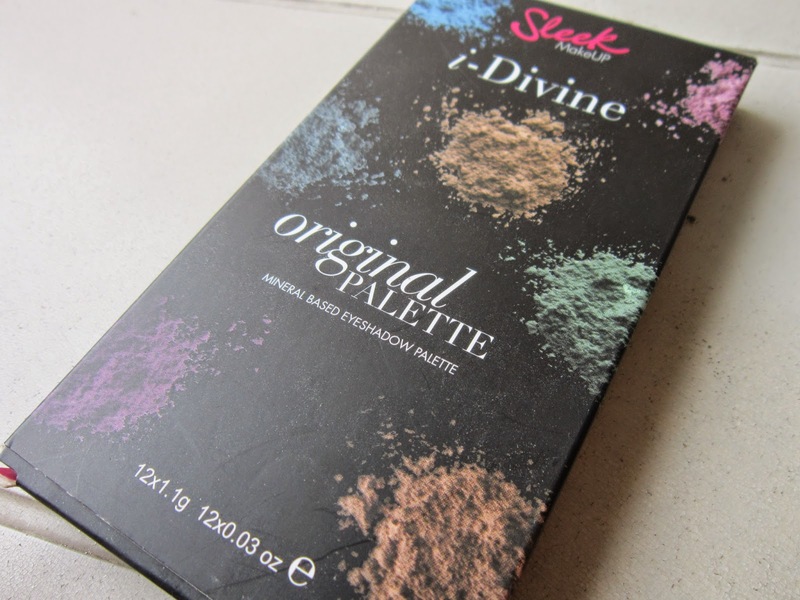 Then one day, while browsing makeup blogs, I found the 'Sleek MakeUP I-Divine Original palette' on a blog sale & fell in love! So here's a review/intro of the newest love of my life, who is here to stay...that's it, I'm committed!! Packaging - The palette comes in the black cardboard packaging with a sneak peek at some of the shades inside. It has the name & branding done on the front, while on the back, there are other details like description, suggestions for possible makeup looks, ingredients & manufacturing details. 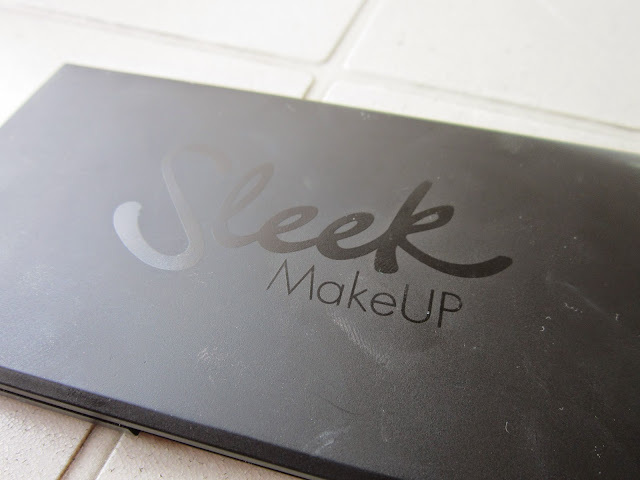 When you open the palette, you'll find a conveniently sized mirror to create or touch up eye-looks on the go. It's just the right size to fit into this travel-friendly palette. 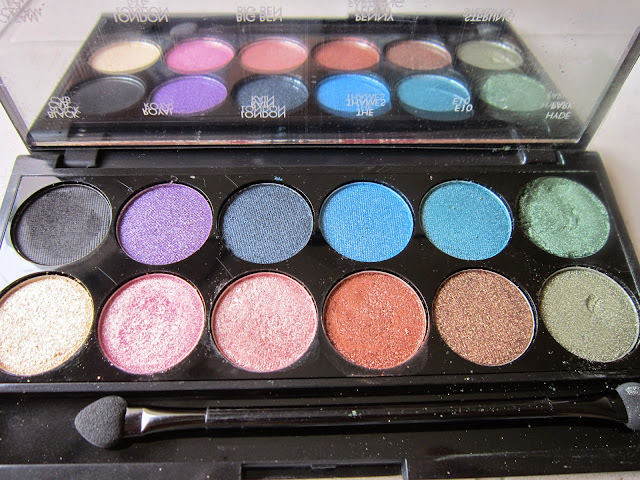 The eye shadows are covered with a thin plastic film that states the name of each shade. The palette also comes with a dual-ended eye shadow applicator. 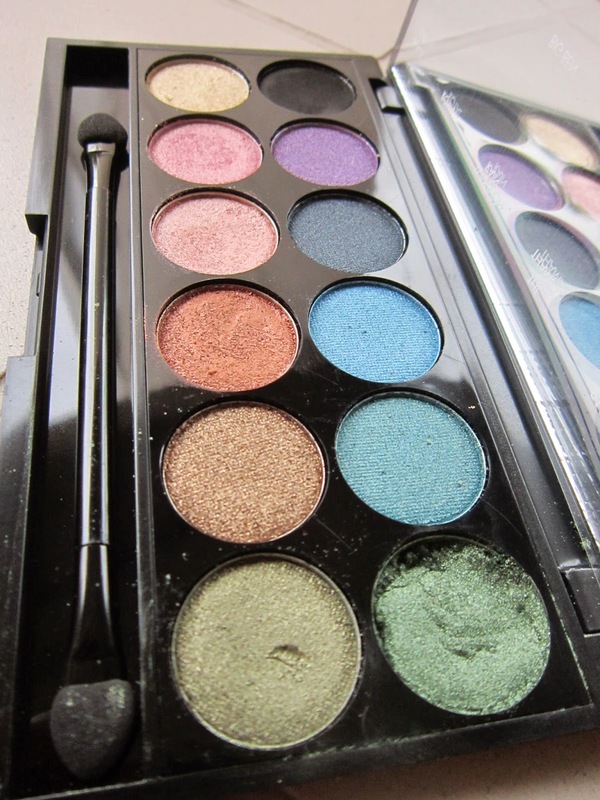 Theme - Sleek eye shadow palettes come with 12 long-lasting mineralized eye shadows that have been themed differently. The more popular ones that I've heard of are Oh So Special, Au Naturel, Storm, Vintage Romance, Sunset, Bad Girl palette, etc. with shades that flow with the theme, for e.g. Sunset Palette has warm, orange, "sunset-like' colours, while 'Au Naturel' has some lovely natural, neutral shades. 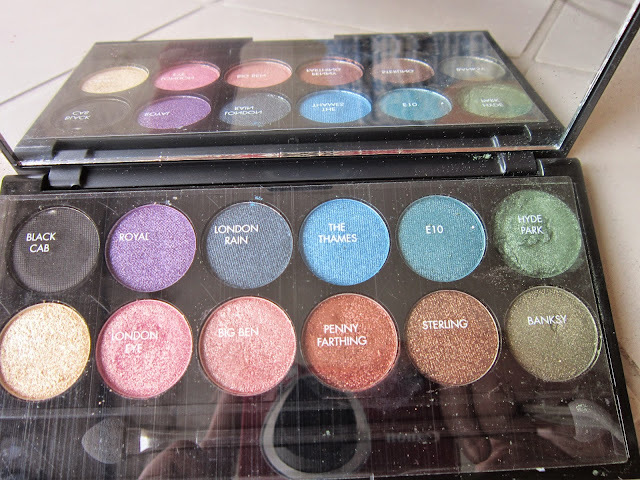 As for me, I fell hard in love with the Original palette because it was sweet, simple & 'un-themed' apart from the extremely interesting names, of course! Colour selection - The names have a distinct 'British' flavour to them & are based on the sights you might see or experiences you might have, when in the UK like London Eye, Big Ben, Cream Tea, Black Cab, London Rain, etc. The shades in the palette are beautiful and varied, with champagne shades, pinks & purples, tones of blue, copper, bronze & shades of green and olive. Apart from Black Cab, a matte black shade, all the other colours are nice & shimmery. The shimmer isn't overpowering and tacky, it's very fine and looks wonderful on the eyes. Sometimes, if I can’t think of any particular combos, I simply use any one lid colour, blend the matte black in the outer V of the eyelid & get done with it..!! At times, I skip the black and blend a darker shade of the same colour on the outer corner for a monochrome eye-look (ooh! look at me, trying to sound like big-shot makeup artist!). London Rain & The Thames are from the Blue family, while London Eye & Big Ben are shimmery rose-goldish shades. Hyde Park & Banksy bring in the green tones to the palette; Sterling & Penny Farthing are the sultry coppery, bronzy shades. I also really like Royal, which is a totally apt name for a beautiful purple in the palette. Texture & Pigmentation - The texture of these shadows is buttery smooth & they're deeply pigmented. They can be easily applied with your fingers as well as brushes, depending upon your preference. Most importantly, they blend like a dream! I'm lazy and don’t wear any eye-primer on a daily basis (Read about my cheat for an eye-primer HERE), however these eye shadows don’t need it. They're really long-lasting and stay on for more than 5-6hrs on my oily eye-lids. Hmmm, so I'm thinking if I can just get my lazy bu%& to religiously use primer for my eye makeup, these would easily last for more than 8-9 hrs. My experience with the Sleek MakeUP Original Palette - I was impressed with the palette because all of its colours; being so different from each other, they're absolutely wearable. It’s a "match made in heaven" for me because it’s got all the shades/colours that I might actually get a lot of use from. 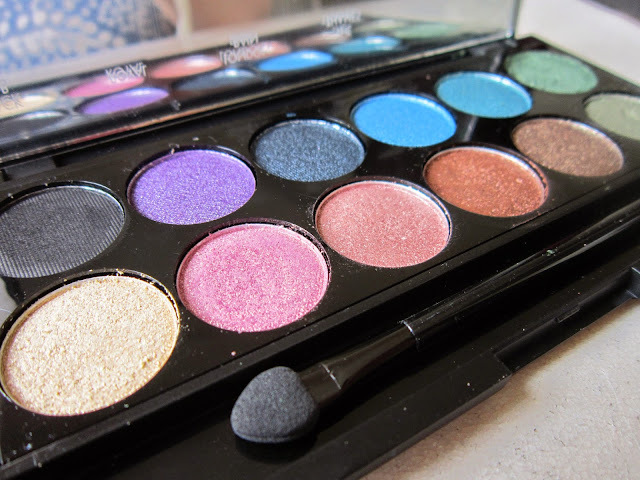 If you're a beginner & are in the market for a shimmer eye shadow palette, then this just might be the thing for you :-); it's got almost every shade you might need! I have been using this palette on a daily basis for one-shadow everyday looks. The colour selection is beautiful and has shades like Cream Tea, Big Ben and London eye, which can be worn on their own, to enhance the eyes. And when I'm in a mood to match my eyes to my outfit, I have an array of shades to play around with! ;-) For more dramatic looks, I blend Black Cab in the outer-V of the eyelid & use Sterling, Penny Farthing or London Rain on the lower lash line to further define the eyes and add more drama. Looks like I could go on and on about the different looks I have created using this palette, but wouldn't it just be more fun to show you rather than speak about it? So stay tuned for more eye looks, coming up on this blog!! Until the next post Mates, Ciao! !